If Apple’s shiny new red iPhone 7 caught your eye on Tuesday when it was first announced, grab your wallet—it’s now officially on sale, as of 8:01 a.m. Pacific/11:01 a.m Eastern on Friday. Also available now is the new 9.7-inch iPad, which replaces the iPad Air 2. 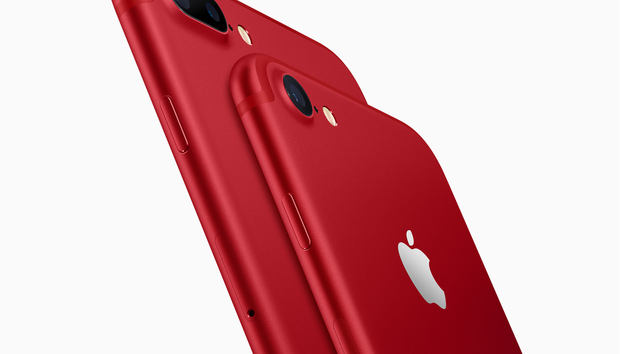 The Product(RED) iPhone 7 and iPhone 7 Plus are exactly like the existing iPhone 7 and 7 Plus, just in a new color—an aluminum red backing with a white front bezel—and Apple donates a portion of each Product(RED) device sale to the Global Fund to Fight AIDS. Pick between the 128GB iPhone 7 model for $749 and the 256GB model for $849; the iPhone 7 Plus will set you back $869 or $969, respectively. If you’re enrolled in the iPhone Upgrade Program, the cost of an unlocked red iPhone with AppleCare+ starts at $37 per month. It’s available in Apple stores now, and you can reserve one online for in-store pickup for peace of mind. As for the latest 9.7-inch iPad, you can order it online today for pickup or delivery next week—Apple’s online store says it will ship on March 31. It comes in 32GB for $329 (which is Apple’s cheapest entry-level, full-sized iPad to date) and 128GB for $429, and you can add cellular connectivity for $130 more. It includes Touch ID, Apple’s A9 processor, and 10 hours of battery life. Pick between silver, gold, or space gray. Oh, and the iPhone SE with an increased storage bump—Apple doubled its storage from 16GB and 64GB to 32GB and 128GB—is also available now, for the same entry-level price (starting at $399). You can find all of these new products on Apple’s website, in Apple stores, and through some certified Apple retailers—our friends at iMore spotted a great deal over at Best Buy that gives you a $25 gift card when purchasing an iPad, and an even better gift card deal if you trade in an older iPad.